CRY Denver – We are committed to helping under-privileged kids live a better life! 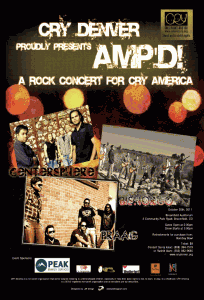 A rock concert for CRY AMERICA! Music transcends Race, Color, Age and Class….Kids with no opportunity to enjoy music just need a little help to rise up and be counted. Join us for a rocking evening of fun and help them! Featuring Alternate Rock Band, Centersphere and Fusion Rock Band, Bishorgo and Rock Band, PRAAG!
" Alternative Rock band Centersphere from Denver. This bands journey started in January of 2011 with four enthusiastic musicians who came together to write meaningful and fun music. This is going to be a stepping stone in their journey, performing to support the rights of children. They will bring you a full hour of high energy alternative rock numbers from their own orignal compositions. To learn more about the band visit http://www.facebook.com/centersphere"
It is a group of musicians coming together from diverse walks of life to create a sound that is at the same time, familiar and new. Appearing from the mist like Brigadoon, the band exists only for brief moments when a fundraising event or good cause comes calling. Bishorgo is deeply rooted in jazz-rock fusion and they artfully combine the folk roots of the Bangladesh people with American rock sensibilities. The love of music, friendship and the desire to explore new realms is what binds Bishorgo to this earth. "Rock Band PRAAG from Denver. PRAAG was formed in Fall of 2008 with two music enthusiasts (Emon (Bass) and Rashid (Drums)) who just moved to Denver area and wanted to start a rock band of a different nature! The primary focus of PRAAG has been to promote Bangla Rock music around USA. Soon, various musicians joined in as guitarist, vocalist and Keyboardist to give PRAAG it's full form in May of 2009 when they launched their campaigne with a live show in PARKER, Colorado called "THE NEW BEGINNING". Since then PRAAG has performed few more live shows around Denver and one show in Houston, TX. They are back after almost a year long break with fresh faces and new energy to give you adrenaline inducing, popular Hindi, Urdu and Bangla rock numbers." Sponsors – We are grateful to our sponsors who are helping us bring this event to you! "BOMBAY BOWL – Bringing you the exclusive snack and beverage stall at the event! Introduce your taste buds to some incredible new friends. Bombay Bowl is the fast-casual evolution of contemporary Fresh & Healthy Indian cuisine. They also offer a large selection of Gluten Free and Vegetarian Selections. It’s a great place for a healthy lunch or dinner. It’s an interactive casual dining experience that is full of fun, choice, and control. Visit us at http://www.bombaybowl.com or stop by our restaurant at 575 Lincoln Street, Denver." Khan realty - Specialized in residential buying and selling with personal touch. FREE custom package available for Investment properties for your specific needs. Your personal realtor that knows you.